The verandah has become something of an Australian tradition, perhaps nowhere more than Adelaide. Whether you own a beautiful old home or a brand-new modern home, a verandah can add value to your most precious possession, now and well into the future. One of the most important considerations when designing a verandah is matching the style of your existing home. 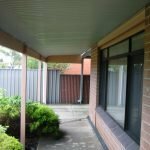 While any Adelaide verandah can provide shelter and shade, a truly well-designed Outside Concepts verandah will perfectly match and enhance your house. The choice of roofing style and materials are key factors. For the roof, your choices include flat, skillion, gable, hip or dutch. For materials, you have the choice of timber, steel or aluminium. Timber is generally the best choice for older style homes as it looks great and is economical. Steel costs a little more but is longer-lasting and requires less maintenance. Aluminium has the added advantage of being rust-free so is perfect around pools. The choice of roofing material is also important and options include tiles, Colorbond steel and polycarbonate. If you get Outside Concepts in Adelaide to design and build your verandah, you’re assured of creating a verandah that will match your home beautifully. We’ve been designing and building verandahs in Adelaide since 1991 and can make the process easy and hassle-free. Find out more about how Outside Concepts can create a beautiful verandah for your Adelaide home here or call us on 1800 601 674.